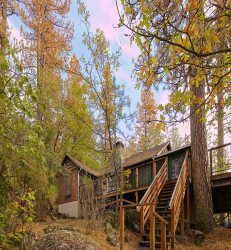 This cabin is rustic in its furnishings, yet has all the amenities you need for an unforgettable vacation experience. Spectacular lake and mountain view from the living room and multiple decks. Fully equipped kitchen, plus a ‘mini-kitchenette’ in the downstairs space. Plenty of room for multiple families to share and enjoy the lake. Private dock with tables & chairs at the lake. An ideal location for reunions, retreats, special events, and more. And to top off your stay, you are within 20 minutes of the South entrance to Yosemite National Park where you can tour and enjoy the breathtaking beauty of the park and its waterfalls. Love this rental! It's perfect for our large group and has everything we need. The view is AMAZING! Best cove on the lake. Great stay. This house was a fantastic place for our family of 20 member. It was clean, neat. 2 kitchens, one on the main level and a small apartment sized one below on the lower level. We enjoyed the fact that there are 3 bathrooms and 3 TVs. Great WiFi speed too. All in all it was super.